ProAdmin2's Blog | Office professionals going to the next level. In today’s job market it seems like you have to pull a rabbit out of your hat or have tricks up your sleeve to even get a job interview. Below is a list of 6 tips and tricks for an effective job search. These sites will not only allow networking opportunities but also alert others in the field that you may be a viable candidate. Social media networking can help, but also hinder. Beware of posting pictures that you would not want an employer to see or discussions that are inappropriate. In today’s job market, employers are searching for the job seekers “digital footprint” and if obscenities are found an interview will be less likely. 2. Cater your resume to each job. When applying for jobs, make sure the cover letter highlights specific job skills according to that particular job description. Sending a “general resume and cover letter” isn’t very enticing to the employer. The key to an effective resume is to stand out amongst the hundreds that are received, so be creative and specific. 3. Include pertinent information on the resume. This includes any certifications, awards, and accomplishments or contributions you hand a hand in at the companies listed on your resume. Depending on your work experience, try to stay away from the standard list of job duties. Remember the key is to impress the employer with any accolades or accomplishments. 4. Proofread your resume and keep it professional. Nothing puts your resume in the “rectangular file” quicker than typos and spelling errors. This is the quickest and easiest way an employer will sift through the many resumes. Get a friend or colleague to review your resume before making it public. Add an appropriate email address and telephone number that has access to voicemail so that you can receive responses. Create an email account solely for your job search. An example of an appropriate email address would be simply your first and last name. Make sure your voicemail recording is appropriate and when answering the phone, sound professional. Employers use the phone interview as a way to weed out candidates as well. If you answer the phone in an uninterested or unenthusiastic voice, your chances of getting an interview are null and void. 5. So you got an interview….Now do your homework. Visit the company’s website thoroughly and prepare questions to ask the employer. Asking questions says to the employer that you are genuinely interested in becoming a part of the company’s team and that you have taken the time review the company’s bio. Years ago, I had an interview with a company and prior to the interview, I visited their website and found a few spelling errors, when I pointed this out to the employer they were impressed and I got a second interview and later got offered the job. Send a thank you note to the interviewer(s), thanking them for their time and reiterating your interest in the job position. This is an important part of the interview process, be sure to highlight those specific job skills that make you the perfect candidate for the job. So you really don’t need magic to get a job, but you do need to be as the magician and know the secrets to get the interview. As long as you know the tricks, just like the magician, you hold the Ace. Building a career can take years to do; however, it only moments to kill that hard work and effort that took so long to establish. Here are 10 ways that can kill your career. 1. Absence of a Network – It is important to become affiliated with people in your industry. Align yourself with individuals and companies who are in your line of work. Join social media websites such as LinkedIn, Facebook, and Twitter. You want to know what’s going on and you want people to know who you are. 2. Poor Communication Skills – being an effective communicator takes practice and work! The messages you send both verbally and non-verbally are important and noticeable. You must have the ability to get your point across in a positive manner through presentations, emails, in business correspondence, and most importantly one-on-one conversation. 3. Lack of Professional Development – Today’s society is constantly changing; it is important to stay on top of the latest developments. Whenever possible take a class, workshop, seminar or attend a conference. Not only will you brush up on skills, you may learn new ones that will be important to you longterm. Get a certification. These are great additions to your resume and make you more marketable. 4. Inappropriate Behavior/Poor Attitude – negative behavior such as rudeness or arrogance are sure ways to kill a career. Whether you are an employee of a company or an entrepreneur, you are representing that business and yourself- poor attitudes will make clients not want to do business with you, co-workers will shun you, and you are subject to poor performance reviews. We all have bad days, before your attitude spills over to others, take a break, get some air, or maybe excuse yourself for the day. 5. Poor Organization/Time Management – Keep deadlines. Use calendars, reminders, learn to prioritize. If you need more time on a project, ask for a moderate extension or seek help. Make every effort to complete the initial proposed deadline; however, if you need more time to conduct research or prepare ask for the extension in advance of the deadline. In other words, don’t wait until the day before. 6. Too Many Unexcused Absences – We all know life events happen; however, constantly taking time off (unexcused absences) is a negative sign to the employer. If you are experiencing “job burnout,” talk to your supervisor immediately –you may need a mini vacation, practice relaxation techniques, or take additional small breaks throughout the day in order to temporarily get away from the office mania. 7. Misuse of Company Policies – For example, social media is on the rise and a benefit to any company and person’s career. However, there is an appropriate time and place to view these sites. Review your company’s policy before visiting these sites on company time. Remember, your online activity can be tracked and inappropriate conversations via instant messaging and other sites can be viewed by your employer. If the online activity is not company approved or for business purposes, wait until you get home. 8. Misunderstanding Critiques/Criticisms – Performance reviews are a time to receive feedback and see what areas in your professional development need improving. Accept these critiques openly. This is a great time to ask for funding to attend seminars and workshops to improve on the suggestions made by your supervisor. 9. Inappropriate Dress Attire – Get re-acquainted with your office’s policies on dress attire. You want to be taken seriously by your peers, clients, and customers, a professional appearance is important. 10. Poor Work Ethic – Incomplete projects, missed deadlines, unreliability and not being dependable are ways to murder your career. You will not get good references when needed, people will not ask you for help, and you will receive poor performance reviews. Your credibility is one of the most important assets in your career and should not be de-valued. Stay on the career path to success. Don’t be a murderer and get a life sentence that will make it more difficult to rebuild what you worked so hard to create. Protect your career and your employer’s investment – YOU! As far as the eye can see there are little squared spaces occupied by their residents. For at least 8 hours a day, these spaces are inhabited by every type of individual that can remind you of your neighbors at home – the hermit, the hoarder, the constant borrower, and the person who frequently disturbs the peace. Here are a few rules you can abide by in Cubicle Junction in order to be a good neighbor. Respect your co-worker’s space. Behave as if there is a door separating you and your co-worker; do not just walk into the person’s space without letting them know you are there. Either announce yourself or lightly knock on their wall. If they are on the phone, wait until they are done or come back later. Those family vacation pictures or your child’s crafts are a nice touch to your space. However, be mindful of what can be considered distasteful or insulting. Refrain from adding things such as pinup calendars, slang writings, or anything that may seem threatening or offensive to your co-workers. In addition, plastering your wall with lots of memos, post it notes, and other items that may seem helpful to you can give others the impression that you are unorganized and disheveled. Use a desktop filing system (add colored folders to categorize) to make it easy to reference information. Rule of thumb – if you can’t see the cubicle wall because so many papers are covering it then the “wallpapering” system may be too much. Be tactful. Use your “library voice” in conversations; if you are standing at a place where someone is on the phone, either move the conversation or whisper so the person is not interrupted. Keep music on a low volume or use a headset. Some people can become easily distracted from the noise level. If possible, reduce the ringer level on your desk phone. 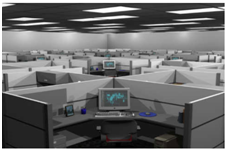 If you share a cubicle, be courteous and ask your “cubby mate” if the noise is bothering them. Then make adjustments, if needed. Cubicle junction should be an effective, peaceful work area and because you will be there for at least 8 hours, it is important to be able to work together. In the event of a misunderstanding or a concern arises, speak with your neighbor immediately. If the conflict persists, speak with a supervisor. Harmony makes for a less stressful and more productive environment. Leftovers from last night’s dinner would be a great lunch for today; however, not everyone likes the smell of alfredo with extra garlic. Or maybe you put on too much of that new perfume or cologne your spouse bought you for your birthday. Be aware that what smells good to you, may not smell good to your neighbor. Use moderation when spraying on the cologne or perfume and for foods that have significant odors (i.e. garlic, onions, etc) take your lunch outside or to the lunchroom. No one likes an angry or dissatisfied neighbor. These are the simple rules in cubicle junction that if followed, will make for more productive, satisfied employees and everyone will be on one accord. People will feel more comfortable in their environment and will be able to focus and concentrate more easily. Realize that for each task or project you complete you are entitled to a personal reward. Obviously, you will get accolades from your employer such as promotions or bonuses but you should also make a point to reward yourself. Work doesn’t feel like work when there is some amusement instituted. This will make for a positive work environment and people will be more productive and want to get the job done and will be yearning for more. Completing the same task over and over again can be boring and people will lose interest with the same routine. Suggest ideas on how to acquire the same results or goal but from a different prospective. People will be more energized and enthusiastic about the project. In other words, think outside the box. When we have a clear outline of how our goals are reached we perform better. It is important to write them down. Of course, they can be altered as the need arises, but putting goals in writing and a thought out plan of how to reach them will solidify what is trying to be accomplished. The ability to think positively about work or personal life events can be tough when there are obstacles that attempt to block our goals. Since we cannot change others attitudes, it is up to us to change ours and adapt. Remember, accept the things you cannot change and change your attitude. Thinking positive will make you more productive and enthusiastic about your results. Maybe you were having a bad day or you were stressed about personal problems and you have consistently missed deadlines. Perhaps you are having conflict with a co-worker and the conversation you had with him or her got out of hand. Whatever the case may be, your supervisor was required to issue you a disciplinary action. It is difficult to deal with a disciplinary action, especially if you have exhibited a “clean” record. The following tips are ways to effectively deal with a disciplinary action. It is important to be positive and acknowledge the fact that the supervisor is expressing their concern about your actions or behavior. After you have been told the nature of the reprimand, politely thank the supervisor for bringing this matter to your attention. This is not admitting fault but only expressing appreciation for being told of the issue. If applicable, ask the supervisor for suggestions or recommendations as to how you could have handled the situation differently and take notes. Taking notes is an indication that you are concerned about the problem and also notes aid in reflecting after the meeting to review and collect your thoughts when you are in a calmer state. If you are asked to make a comment in reference to the issue, think very carefully before answering. Most likely you will be emotionally charged (angry, hurt, and betrayed); therefore, making a statement may have consequences. Give yourself time to evaluate the situation. It will be easy to become defensive; however, keep your emotions in check. If you choose to refute the action or make a statement (in writing) to your supervisor at a later date, do so. At that time, you will have better control of your emotions and will be able to think clearly and communicate more effectively. Remember to remain professional. Become familiar with the company’s HR policies and employee handbook. If you have a union at your place of employment, read the policy on disciplinary action. If your company does not have a union, check with the HR department on policies and procedures for issuing reprimands. A disciplinary action is an eye opener that indicates a request to modify or change a behavior. This is an opportunity for you to change your behavior before the mannerism escalates and further action is needed. Remain open and optimistic. Maintaining a professional and positive demeanor with your co-workers will be beneficial to your career and development.